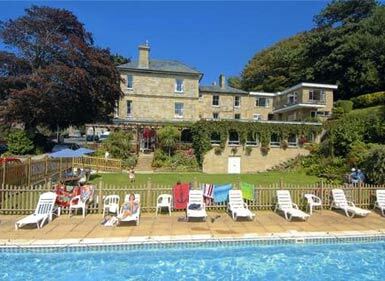 When it comes to Isle of Wight hotels, you will find the Eversley Hotel hard to beat. It stands in an acre of grounds next to the picturesque Ventnor Park. The hotel was originally built as a gentlemen´s residence in 1872 and has been in our family for 40 years. Over that time, the hotel has established a reputation for good food and a friendly service. All our 30 bedrooms are en-suite, comfortably furnished with colour television, tea & coffee making facilities and telephone. Some are family suites with a separate children´s bedroom and communicating door. Ventnor is renowned for its mild climate and has an almost Mediterranean feel, due to its southern aspect and the shelter it receives from the high cliffs and downlands behind it. Just to the west of the town the Eversley Hotel boasts its own private access to Ventnor Park , coastal paths and walks. These lead to Ventnor beach, Steephill Cove, Ventnor Botanic Garden and further. Our dining room faces the park and serves traditional breakfast and a five course evening dinner using fresh local produce whenever possible. The daily changing menus always feature fish and vegetarian dishes as well as a choice of two other main courses. Our lower gardens and patio face south west and are ideal to soak up the sun. The upper gardens face due south across the English Channel and offer seclusion with wonderful views and access to Ventnor park. The 40ft outdoor heated pool is open from May to October and there is a children´s paddling pool for younger guests. Drinks and light lunches are available from the bar to enhance a relaxing stay. For special occasions there is an a la carte menu offering local seafood amongst other dishes. To complement your dinner, we have a good selection of wines and liqueurs. For your relaxation in the evenings we have a well stocked bar and lounges. The fitness and leisure facilities feature a small but well equipped gym with cardiovascular and strength machines and a five person spa pool. Open daily 10am to 6pm.